The 5th most popular motorcycle in Australia in 2017 was the Kawasaki KLX110. The KLX110 sold 1457 units for the full year and is one of most popular motorbikes in Australia. 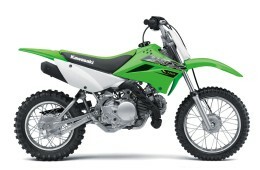 For me it is not surprising that over half the top 10 motorbikes in Australia are trail bikes or off road focused. But I was surprised that most where for children rather and drivers license age aka 18 years old. In terms of design there is nothing special about the KLX110 but it looks like a genuine mini enduro bike which is part of its appeal. Further more the KLX110 and it’s competitors can only be ridden off road by the target age group, essentially the kids under 10 years old. Good to see so many be being bought for youngest motorcyclists. I’m not sure whether the KLX110 technical specifications will mean all that much in this motorcycle category but judging on the popularity of the road legal Honda Grom, the KLX110 and it’s competitors have a significant impact on future motorbike riders.